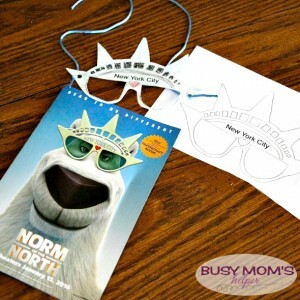 Our family loves movies, and are super excited for some amazing ones hitting theaters this year – like Norm of the North on January 15th! As we’re getting ready for a family night out, I thought it’d be fun to make a fun New York City Sunglasses Printable for the kiddos. Now they’re just like Norm! 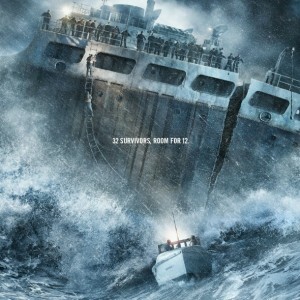 The latest movie release from Lionsgate introduces a big-hearted, talkative polar bear named Norm. Going from his home in the Arctic to NYC, he’s on a mission to prevent his beloved home from being overrun by developers looking to profit from the land. With some crazy-yet-helpful friends, Norm takes on the Big Apple, big business and a BIG identity crisis as he tries to save the day! After we watched the trailer, the kids asked me ‘wouldn’t a polar bear be afraid to go to New York?’ I would think so! That led to a deep discussion about how sometimes you have to do things that scare you – take adventures – to kind of find not only what you love and what makes you happy, but who YOU are. I can’t wait to see the film with them so we can go further down that rabbit hole of a discussion! Of course, we also had to discuss adventures WE’VE taken as a family – such as our all-of-a-sudden job switch for hubby, then moving an hour away from friends and school. It was terrifying, to be honest! But we learned so much as a family – working together, including the kids in the packing and planning, and making NEW friends. Through the whole process, we talked about how we could either be grumpy and make it even harder, or embrace this new adventure. We chose the latter, and now the whole family is better off for it! For these printable sunglasses, first Download it Here. 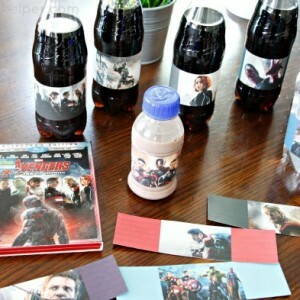 It prints onto an 8.5×11 sheet with TWO sunglasses cut-outs per page. Let your kids color them, help them cut-out the eye parts, then use a whole punch and yarn/ribbon so they can put it around their head. Super simple, but the kids LOVE it! Now they’re begging me to see Norm of the North IN New York City – oh, if only! What adventure has YOUR family embraced lately? Now who wants a GIVEAWAY? Free stuff is always good, right?! You can enter to win one of 5 $100 Fandango gift cards so you can get tickets to see Norm of the North in theaters! The contest is open Monday, January 4th 2015 until Monday, January 21st 2015.
Who else is a huge fan of Rebel Wilson? I seriously LOVE her – so of course I had to grab her newest movie the day it hit stores! Just like it’s prequel, it has so many memorable and hilarious lines in it – I couldn’t resist making these fun Printable Quotes from Pitch Perfect 2! I would love to know how many of the lines were scripted, and which ones were improvised because it was ACA-HILARIOUS! I’m so glad I grabbed the Limited Edition Blu-ray combo pack from Walmart that even includes a soundtrack with 8 hits from Pitch Perfect 1 and 2! One of my absolute favorite lines in the movie is “I’m gonna remember you weirdos” – it’s like the story of my friends and I! Seriously, it’s not the competitions, the awards or prestige you remember in life. It’s the people by your side – whether they are completely weird and crazy or not! Although I personally think it’s more fun with crazy people 🙂 I cut out some of the printables from this SHEET DOWNLOAD and attached them to little packs of cookies I could share with my own ‘weirdo’ friends. Head to Walmart to grab the exclusive Pitch Perfect 2 Blu-Ray/Soundtrack combo pack. The soundtrack includes some of your favorite songs from Pitch Perfect and Pitch Perfect 2 (while supplies last) – pop it into your player and sing along! This post contains affiliate links that help support this blog at no extra cost to you. It’s been planned since we bought tickets to Family Forward MONTHS ago, and the best part? We haven’t told our kids! We’re going to wake them up early on the 3rd (when you’ll probably be reading this), tell them we’ve got a surprise and head to the airport. Neither hubby or I will say a word about this great adventure until we land. Woot woot! Fingers crossed I can keep my mouth shut until then. And big SHOUT-OUT to my sis-in-law for staying at our home while we’re gone to keep our dogs and everything safe! 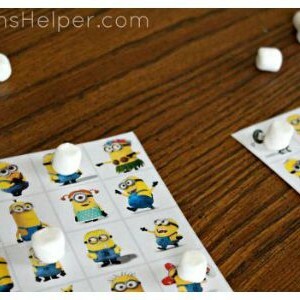 Even though the kids have no idea why, I’ve been doing more things involving the trip – Minions, Harry Potter (squeal! ), Transformers and more. Another Dallas blogger and her family are going, and it turns out we’re on the same flight there – and her girls are about the same age as my Black Widow! They’re going to have so much fun – and she’s keeping it a secret, too. With all the extra things I’ve been doing, I pulled together these fun Bingo cards because, well, why the heck not?! There’s three pages, and each has TWO different Bingo cards for a total of SIX different cards. Schedule YOUR next vacation with Get Away Today now! Use Promo Code: BMH16 for $10 off your vacation package! My daughter has been non-stop excited for months now, anxiously waiting the new The Disney Channel Original Movie, Descendants. We made sure to catch up on the classic movies with the original villains before it released on July 31st – have to make sure we can match people up, right?! Now you can do even more matching with this fun Disney’s Descendants Free Printable Memory Game! Not only did Descendants come to The Disney Channel, but also on DVD at Walmart – so for those of us without cable it wasn’t a heartbreak situation! We nabbed that up, along with the official movie soundtrack….Black Widow was SO happy because we literally grabbed the very last soundtrack they had in stores! See some of the empty shelves? Yup, we grabbed that sucker and she wouldn’t let it go until we got to the register! Now, I said that she was excited – but I’ll freely admit that I was also really eager to see this movie because – hello! – Disney villains with kids? That’s gotta be fun, right? You’ve got Maleficent; how could she not be the poster mother, after cursing a little baby 😉 – Jafar; his temper would surely be great dad material – Cruella De Vil; her animal hatred surely wouldn’t get in the way of her kid having a pet – and The Evil Queen; what a great role model at inner beauty! I hope you noted the sarcasm there – but really, I just had to find out how this whole thing would work out between the favorite villains I grew up with, and a whole new generation in a ‘modern’ world. 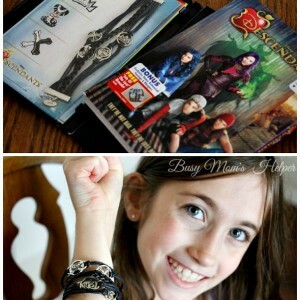 The DVD at Walmart even has a special bracelet in it, with a little charm for each of the four villain kids! I told Black Widow she could wear it awhile – but honestly don’t know if I’m ever going to get it back. I think she set a new record for high-pitched squealing when I told her they also had dolls at Walmart of the characters! There were so many fun ones to choose from, but we ultimately decided on Mal (Malificent’s daughter) and Evie (Evil Queen’s daughter). Think my girl’s grin could be any bigger – and they weren’t even out of the box yet?! She loved that each of the dolls had neat little details – from the clothing to the shoes, plus the little ‘extra’ like Mal’s spellbook and Evie’s Magic Mirror. They did so great at adding different and fun personalities to each of the villain’s kids – and you’ll LOVE the music that goes along with it! Now get in on the fun with this Free Printable Descendants Matching Game! I tried to include everyone – from the main villains and kids, to the Fairy Godmother, Dopey’s son Doug and even Mulan’s daughter Lonnie! Seriously, you’ll be amazed how many of the classic movie characters they were able to tie into Descendants. What Disney villain is YOUR favorite?